A Huge stylish 1970s Pioneer Batch, close to the historical Stone store and mission house. It is only 5 mins to the boat ramp, and the well known landing swimming area. There are world class Restaurants close by, only 2 mins walking distance, across the bridge to the stone store and then to the famous "Pear Tree" bar and restaurant. Further up the hill is the wonderful "wharepuke restaurant" These venues have attracted many tourists, who enjoy the food and relaxed atmosphere. Beaches are everywhere, and only a 5 minute drive to Kerikeri, 20 minute drive in any given direction to Paihia, or Opito Bay. Or drive 2 mins down to the boat ramp to launch your own boat into the ocean for a days fishing in the Bay of Islands. Respect this House and you will enjoy your stay. Smoking outside areas only. 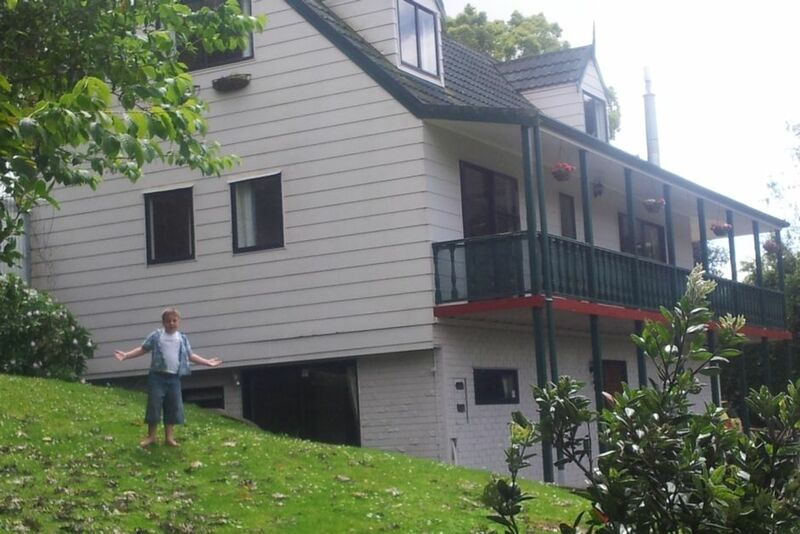 Two storied, huge entertainment decks and lawns and lots of parking, new shower with rain head. each room has a heated wall panel and downstairs has a warm fire for winter months.. The Pioneer Kitchen is functional, lots of plates, lots of glasses, lots of everything that you will need to plan a dinner party for your huge group. stairs to second storey with rail. Big house in great location, easy walk to the stone store. However the interior was very tired, the furniture & kitchen cupboards very old, we felt the price we paid per night did not reflect the quality of the property. There is still an unpleasant smell in the house. The beds were comfortable with nice clean sheets & the new bbq was a winner. We all felt it needs a bit of work before it's rented out again. The lounge suite is being replaced soon, it was damaged by a previous client, and the wall to the kitchen is being knocked down and a new modern kitchen will be in before july hopefully along with a new interior paint job. Furniture gets tired from wear and tear, and I enjoy providing good new clean sheets and providing a huge bbq area and a great bbq to cook on outside. Enjoyed our stay. Easy access to the house. Loved the back area for entertainment. Very child friendly. Beautiful area with Kemp House a 5 minute walk away. The property was ideal for our extended family of 8 people. Our gran was in a wheel chair so the access to the house was great for her. Everyone enjoyed the facilities and their stay there. Having an outside entertainment area was a bonus. The Stone Store was very close and easy to walk to. Lovely spacious house that suited our group. Lovely spacious house that suited our group. Great location. We only had two issues with our stay, first a huge cockroach was found in a bedroom and crawled over someone!! We did catch it and securely left it by the laundry for the cleaner to sort. A fumigation would sort this issue out. Our second issue was it seemed someone had been thru the property whilst we were out. Windows that we had shut were open on our return and a few house items moved. Location great. House on inside very tired. Very unpleasant dog odour. Great outdoor area. Tired interior now refreshed. Dog odour from previous holiday tenants gone..all loose latches, fixed, new 55 inch tv, and mod cons .. Wear and tear from holiday makers all repaired and ready for another season..
A really good sized house that accommodated what we required. A really good sized house that accommodated what we required. Really good location, close to town and close to the stone store. The outside area is really nice and the deck is a very good size. Overall a very good place to stay and would definitely recommend to anyone who is looking to accommodate a lot of people.